I came across this and figured with All Saints Day being this weekend, this was very fitting to share. As we approach the end of the liturgical year, we draw our attention to the last things that await beyond the grave. 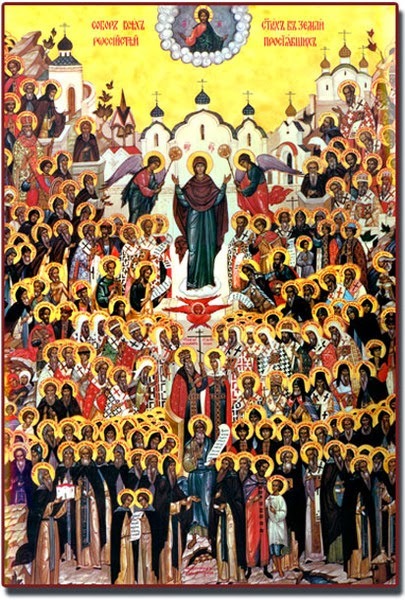 The great feasts of All Saints and All Souls commemorate our beloved dead, but they also remind us of the impermanence of our worldly existence and the eternal judgment in the spiritual realm. In the Northern Hemisphere, we have a vivid expression of decay and corruption all around us in the glory of fall as the natural world sheds its colorful raiment, leaving the barren and stark naked monochrome landscape of winter. By contemplating death, we focus our minds on how better to live, so that when the moment comes–as it does for all of us–we need not be afraid or ashamed of our nakedness in the sight of God as our first parents were in the rebellion of original sin which brought death into the world. As the ancient saying commands us, memento mori, remember that you must die. How we live our lives will determine whether we will join with the saints in the victory of Christ over death. Indeed, the saints are excellent examples for us of how to live–and how to die–with grace. In their last words, many of the saints quote scripture or favorite prayers, while others express defiance as they embrace their martyrdom. Still others provide advice to their followers. As Dr. Johnson once wrote, “Depend upon it, Sir, when a man knows he is to be hanged in a fortnight, it concentrates his mind wonderfully.” The same can be said for the saints in their final moments on earth. In each of the aphorisms collected below, we have a distillation of a life devoted to Christ into one statement which summarizes what was most important to each of these saints in the hour of victory, as each passed through the veil into the presence of God. We would do well to profit from this wisdom so that we might also emulate it–before the bell tolls for our own passing. Lord, eternal King of glory, receive me hanging from the wood of this sweet cross. Thou who art my God, whom I have seen, do not permit them to loosen me from the cross. Do this for me, O Lord, for I know the virtue of Thy Holy Cross. Your will be done. Come, Lord Jesus! My only desire is to see Mary who saved me and who will save me from the clutches of Satan. Holy Mary, pray for me, a poor sinner. Blood! Blood! Father, into Thy hands I commend my spirit. Be brave, because I am going to Paradise; but I shall always remain with you, too; I shall never abandon you! Be joyful, and keep your faith and your creed. Do the little things that you have seen me do and heard about. I will walk the path that our fathers have trod before us. Be children of the Church. When you see that I am brought to my last moments, place me naked upon the ground just as you saw me the day before yesterday; and let me lie there after I am dead for the length of time it takes one to walk a mile unhurriedly. In all things I adore the will of God in my regard. Let me go to the house of the Father. O Christ, only God, O Splendour, O Power of the Father, O Maker of heaven and earth and builder of this city’s walls! Thou has placed Rome’s scepter high over all; Thou hast willed to subject the world to it, in order to unite under one law the nations which differ in manners, customs, language, genius, and sacrifice. Behold the whole human race has submitted to its empire, and all discord and dissensions disappear in its unity. Remember thy purpose: Thou didst will to bind the immense universe together into one Christian Kingdom. O Christ, for the sake of Thy Romans, make this city Christian; for to it Thou gavest the charge of leading all the rest to sacred unity. All its members in every place are united – a very type of Thy Kingdom; the conquered universe has bowed before it. Oh! may its royal head bowed in turn! Send Thy Gabriel and bid him heal the blindness of the sons of Iulus, that they may know the true God. I see a prince who is to come – an Emperor who is a servant of God. He will not suffer Rome to remain a slave; he will close the temples and fasten them with bolts forever. After all I die as a child of the Church. My Lord, it is time to move on. Well then, may Your will be done. O my Lord and my Spouse, the hour that I have longed for has come. It is time for us to meet one another. I have reached the point of not being able to suffer any more, because all suffering is sweet to me. My God, I love You. Be assured that he who shall always walk faithfully in God’s presence, always ready to give him an account of all his actions, shall never be separated from him by consenting to sin. I die the king’s good servant, but God’s first. and in the defense and confirmation of the Gospel.